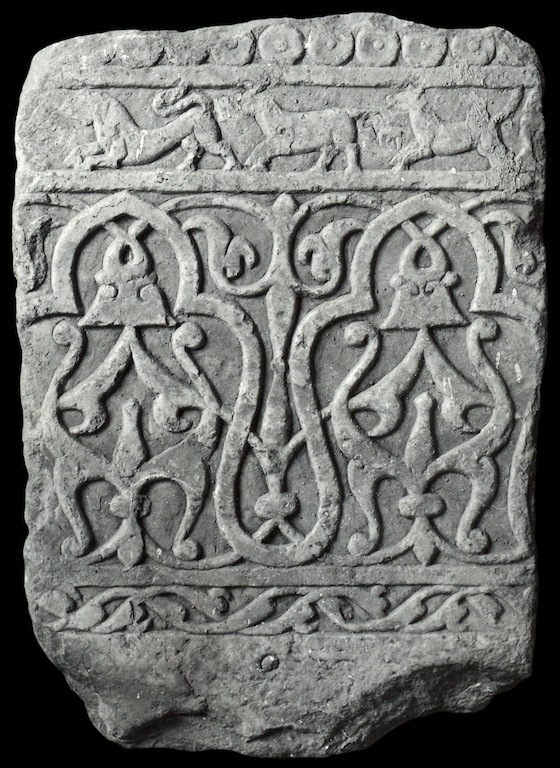 Dado carved in bas-relief (type 22). This type is represented by one specimen. The decoration is composed of four horizontal sections: the upper section consists of a narrow beaded band, the second section of leftbound running animals, the third section of a sequence of continuous trilobated arches, and the lower section of a sequence of two interlaced and rolled up half-palmettes. The trilobated arches are set against a vegetal pattern of interlaced half-palmettes and fleur-de-lis. The height of the panel is 64 cm; the width is unknown; the thickness is 6.5 cm. The panel has an incised mark related to the carvers’ practice; it might be a location mark. The artifact was first recorded in the Kabul National Museum storeroom in 1958; it came from Ghazni.